Normally, if a publisher has a problem with spam bots. it has something to do with dreaded promotional comments that don’t make any sense. But USA Today has another problem—the bots just love the colorful newspaper’s Facebook page. That’s led to the FBI getting involved. USA Today’s parent company, Gannett Co., reached out to the FBI this week hoping that something could be done about these bots that are so enthusiastic about the publication. At one point, recently, more than half of the paper’s Facebook followers were fake. The social network’s terms of service strictly prohibit fake accounts, and three weeks ago, it purged millions of them from its servers. But according to executives from Gannet Co., millions of the followers are still bots, and the page picks up another thousand each day. The excised bots were quite “like”-happy, and were responsible for a third of the page’s 15.2 million likes. Why would a newspaper care if its social media presence is getting a positive boost from fake accounts? According to the paper itself, “a proliferation of such accounts risks damaging a publisher’s brand at a time when the social network is one of the key ways news organizations reach their readers.” That’s one way of putting it. In all likelihood, social media metrics are often given to advertisers and it looks pretty damn bad when a third of your likes disappear. It also harms growth projections when you’re counting on all those bots to keep liking articles and pushing the posts out to reader’s newsfeeds. Facebook believes that the bots are part of a large-scale spam operation that likes fairly banal news in an effort to appear to be an average user account. But the real purpose of the bots is believed to be to push out disinformation or advertising spam. According to a statement from Facebook, a majority of the bots go dormant after building up some likes, and it’s possible they are simply waiting to be mobilized. The FBI has given no comment on the case, so far. 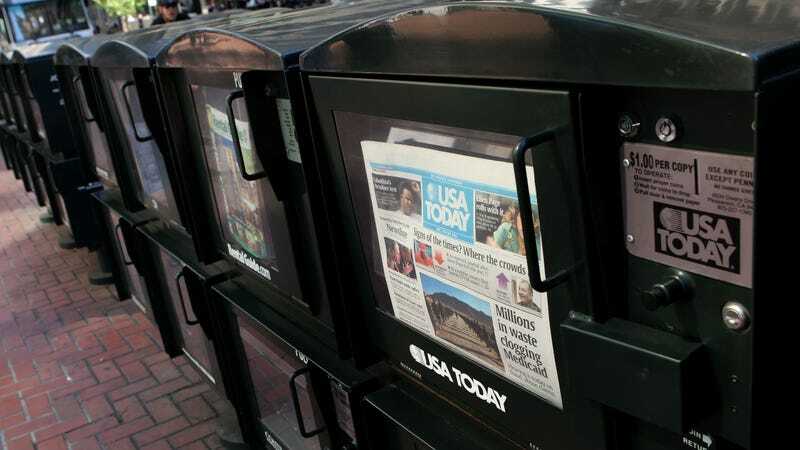 With Facebook reportedly looking to purge another three million accounts, the issue is quite urgent for USA Today’s publishers.